Christine De La Rosa wants queer people of color to benefit from her dispensary — both medically and financially. Eight years ago, Christine De La Rosa (aka Miz Chris) almost died. The San Leandro resident's blood had kept clotting, and doctors couldn't figure out why. On Thanksgiving Day in 2009, she was rushed to the emergency room where she found out she had two pulmonary embolisms in her lungs. She ended up spending a week in the hospital and was diagnosed with lupus, an autoimmune disease that causes the body to attack itself. Although she was prescribed several different medications, none of them alleviated her pain. "I could barely walk," De La Rosa, 47, recalled on a recent afternoon in Downtown Oakland. "I took 11 pills a day and I went every 30 days to the hospital to get an infusion, which is like chemo for lupus, just so I could walk with a cane. If I didn't have that, I would have been bedridden." Eventually, a friend suggested that De La Rosa, who owns two production companies that organized Pride parties in San Francisco and Oakland, get a medical cannabis card. Although De La Rosa didn't smoke, she decided to try it. But her experience at dispensaries left her wanting. Budtenders gave her THC products that made her feel high. "Nobody really helped me, and nobody really understood what I needed because I have lupus," she said. After attending a workshop on the anti-inflammatory properties and health benefits of cannabidiol (CBD), one of the active cannabinoid molecules in cannabis, De La Rosa decided to give cannabis another try. This time, she began experimenting with high dosages of CBD. She said within six months she was able to go off all of her medications, and within nine months she stopped her infusions and no longer needed a cane to walk. De La Rosa began espousing the benefits of cannabis to friends, strangers, and other lupus patients. She decided to translate her enthusiasm into a business. Last year, De La Rosa — who also co-owns several local businesses, including retail store Town Biz, new Uptown eatery Craft & Spoon, and San Francisco art gallery Queen of Hearts — opened a dispensary in Oakland with three other friends and business partners, including Charleen Caabay (who is also profiled in this issue), Chaney Turner, and Michael Schlieker. Benefit Health Collective is what's known as a Measure Z club because it's not licensed by the city and isn't allowed to advertise. Despite that fact, the dispensary, which is behind a locked door of a storefront, has spread by word of mouth and now has about 1,500 patients, according to De La Rosa. Although small, the dispensary carries a wide range of products, from high-THC flower strains to medicated topical rubs and CBD tinctures. De La Rosa is careful about the products she carries: The dispensary doesn't sell vapes that use concentrate made from butane extraction, and she sources her flowers from a grower that does its own testing. Not only is De La Rosa concerned about the safety of her products, but also of her clientele. Because the dispensary is gay-owned and three of the owners are women of color, it was important to her that the space be welcoming to all people, regardless of race, gender, or sexual orientation. 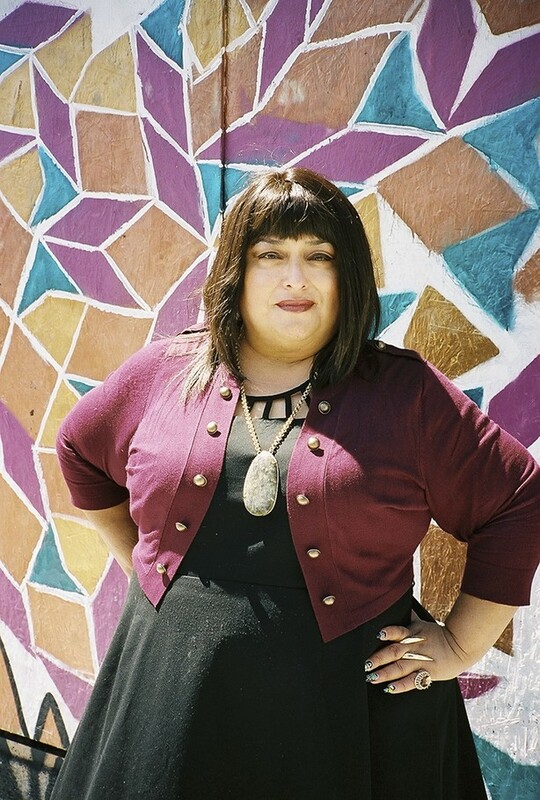 "I feel like when you're a person of color, and when you are a queer person of color, we tend to create spaces not just for our people, but for everybody to feel safe there," De La Rosa said. "The only way you're not going to feel safe in one the spaces that any of us have created is if you're a white nationalist." That feeling of safety extends to the staff. De La Rosa said she loves hiring people who typically aren't hired by traditional businesses because of their appearance. "We have queer people, we have straight people, we have men, we have women, but there's this thread that runs through all of them — they are compassionate, they are careful, and they are accepting of everyone else." Having employees who feel safe and accepted encourages them to pass on the feeling to clients, she added. Cannabis can also help LGBTQ folks deal with the discrimination and micro-aggressions they face, as well as cope with their fear. "A lot of queer people suffer from PTSD," said De La Rosa. "We know why they suffer — I know why they suffer from PTSD, because I've experienced that myself — so being able to help them figure out what their medical regimen needs to be around their anxiety or PTSD is really great. And they feel comfortable coming to us because we are also queer." Now, as Oakland gears up to hand out eight dispensary licenses, De La Rosa and her partners are positioning themselves to get one of them. And she has a radical idea to grow her business — and lift up her community in the process. "I cannot count on the equity permitting that they are doing right now to really work for me or my folks," said De La Rosa. "But as a business owner, I can put it upon myself to have equity." Even though Benefit Health Collective is owned by three women of color and one white man — all of whom identify as LGBTQ — De La Rosa knows they won't qualify for one of Oakland's four equity licenses, which require that an applicant either has been convicted of a marijuana-related offense in the city while earning less than 80 percent of the local average, or has spent 10 of the last 20 years living in a neighborhood with a high rate of marijuana-related arrests. De La Rosa's plan is to buy a brick-and-mortar space and rename the business the People's Dispensary. She envisions individually tailoring cannabis regimens to people based on their symptoms and needs, with herbalists and nurses on hand. She wants private rooms for consultations, couches for patients to relax, and a space for yoga. The dispensary also offers a rewards program and services on a sliding scale. But she also wants a bigger reward for the community — allowing them to invest in her business. Currently, investors in cannabis must be accredited, meaning they have $250,000 in the bank — "which cuts out pretty much everybody in my community," De La Rosa noted. She will raise $1 million through traditional equity investment, but $100,000 will be raised through smaller, non-accredited investors. To legally do so, De La Rosa created a limited liability company and hired an accredited investor and a community organizer to run it. The dispensary then gifted $100,000 in shares to the LLC, which will allow small investors to own a piece of her business. "So I can basically have 100 people who put in $1,000 that will own a part of the cannabis company that I own," De La Rosa explained. To benefit these small investors even further, De La Rosa plans to sell her shares at a dollar per stock, much lower than the actual value. If all goes according to plan, she expects to be fully funded by Dec. 1. Her hope is that impact investors will agree to a fixed return and give the rest to an endowment that would be put that back into the community. Ultimately, her goal is to open five dispensaries in California in three years, including places where cannabis access is limited. She's got even bigger dreams: To get funding to refurbish multiunit buildings in East and West Oakland, where she will allow workers from her various businesses to live at below-market rates, and possibly extend the benefit to other business owners and their employees as well. If De La Rosa doesn't get one of Oakland's four non-equity licenses, the Benefit Health Collective will have to move out of Oakland before July 2018 (although its delivery service can continue). Regardless, De La Rosa will likely keep spreading her message about the health properties of cannabis. These days, her lupus is in full remission. And she only takes about one 25mg gel cap of CBD per day.